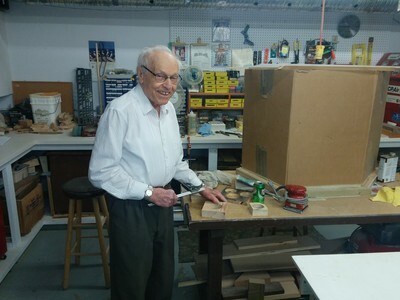 Peter Wladyka, 91 years young, mans the workshop at Christenson Communities' Devonshire Village. Home Care: For people in their own home. An assessment is performed and monitored by qualified professionals to determine the individual's needs. Services are then provided on a scheduled basis. Services can include nursing and rehabilitation, and personal support services like homemaking, bathing, and grooming. Supportive Living (SL): For individuals who want the freedom of a maintenance-free environment or who perhaps require a little more help than can be provided by home care alone. Supportive Living meets the needs of a wide range of people, but not those with complex needs requiring a registered nurse (RN) on-site 24 hours a day. Provisions, more than simply a place to live, can include meals, housekeeping and social activities. Professional and personal support services are also available. Long Term Care (LTC): Care is provided for people with complex needs who are unable to remain at home or in Supportive Living. LTC settings provide accommodation, personal support and health care services. 24 hour care with an RN on-site is provided. Pictured at top: Jean Nason, a resident at Canterbury Foundation, and her companion Susan McGregor, talk about what "Quality Care" means to them. Her response: "Home is where the Heart is. Having a favourite meal from her childhood on the menu occasionally."